She was born in Yedinets (Edineţ), Bessarabia, into a family of laborers. In 1923 she emigrated to Argentina. She began writing when she was young and debuted in print with a story about the Jewish way of life in Bessarabia, which appeared in Di prese (1934) in Buenos Aires. From then on she has published a large number of stories, sketches, images, novels, and reportage pieces in: Di prese and Unzer fraynt (Our friend) in Buenos Aires. 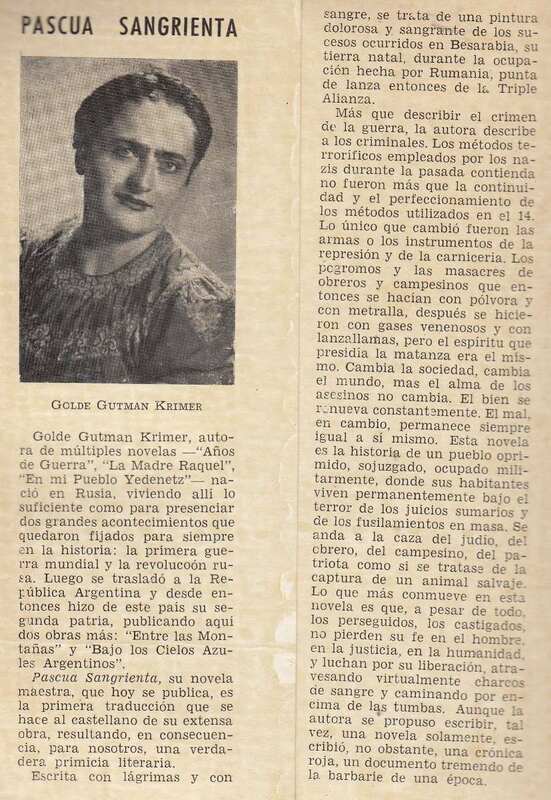 She contributed to Antologye fun der yidisher literatur in argentine (Anthology of Yiddish literature in Argentina) (Buenos Aires, 1944). Among her books: Tsvishn kranke (Among the sick) (Buenos Aires, 1937), 127 pp. ; Vos mayn fraynt dertseylt (What my friend recounts), stories (Buenos Aires, 1938), 97 pp. ; Besarabye in 1918 (Bessarabia in 1918), a novel (Buenos Aires, 1940), 269 pp. ; Mayn shtetl yedinets, shteyger-roman (My town Yedinets, roman à clef) (Buenos Aires, 1943), part 1, 180 pp, part 2, 187 pp. ; Milkhome-yorn, 1914-1918 (War years, 1914-1918) (Buenos Aires, 1945), 251 pp. ; Tsvishn berg, dertseylungen (Among the mountains, stories) (Buenos Aires, 1945), 186 pp. ; Di muter rokhl, roman (Mother Rachel, a novel) (Buenos Aires, 1948), 370 pp. ; Unter di bloye argentiner himlen (yehudis), roman (Under the blue Argentine sky [Judith], a novel) (Buenos Aires, 1954), 370 pp. ; Afn sheyveg, roman (At a crossroad, a novel) (Buenos Aires, 1958), 247 pp. ; Dos lebn fun a froy (The life of a woman) (Buenos Aires, 1958), 284 pp. 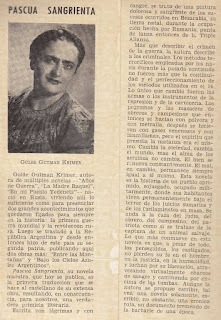 ; A kholem fun a pastekhl (A dream of a little shepherd) (Buenos Aires, 1961), 213 pp. ; Fun dos nay, shpitol-dertseylungen (Starting over, hospital stories) (Buenos Aires, 1962), 307 pp. ; Di vinter-blum (The winter flower) (Buenos Aires, 1966), 179 pp. She was one of the most productive Yiddish writers in Argentina and portrayed with love and good nature in her stories images of the Jewish way of life in the old country in Bessarabia. “A writer with a long breath,” wrote Shmuel Rozhanski about her, “she was one of the few Yiddish writers in Argentina who did not submit to the dominance strain of decline in Yiddish literature, but brought forth a number of creative works in a short period of time. She combined fictional writing with reportage, depicted the surroundings that she observed, and was able with a long breath to recount in fictionalized memories that belonged to the most ardent of realities.” Yankev Botoshanski wrote: “In her novels she painted on a wide canvas Jewish life in Bessarabia.” She also wrote under the name Golde Krimer. She died in Buenos Aires. Sources: Sh. Rozhanski, Dos yidishe gedrukte vort un teater in argentine (The published Yiddish word and theater in Argentina) (Buenos Aires, 1941), p. 178; Y. Botoshanski, “Di yidishe literatur in argentine” (Yiddish literature in Argentina), in Algemeyne entsiklopedye, “Yidn H” (New York, 1957). Golde Gutman-Krimer was my great aunt. Thank you so much for this information. I live in Los Angeles, California but was recently in Buenos Aires and was able to connect with my cousins, Golde's grandchildren, whom I had never met. My pleasure--and this is one of the main reasons I'm translating this immense biographical dictionary. Golde was my great grandmother and I got deeply emotional while reading this lines. I was very young when she passed away, but I remember her kindness and sensitivity. She was proud of her roots. Thanks for remembering her and her contributions. Sabrina Abeid Bokser, Winnipeg, Canada.